Dubai’s Jumeirah Lake Towers, long seen as the less desirable cousin of neighbouring Dubai Marina, is the city’s top performing area for apartment rental values, according to a new report. Propertyfinder Group’s UAE Real Estate Trends 2017 report showed that Jumeirah Lake Towers – more widely known as JLT – was found to be the only neighbourhood in which apartment rental values increased in the six months to March 31. The 1 percent rise compared with a near 1 percent drop in nearby Dubai Marina and Jumeirah Beach Residence (JBR), while Downtown Dubai and Palm Jumeirah tumbled 4.7 percent and 5.8 percent respectively. 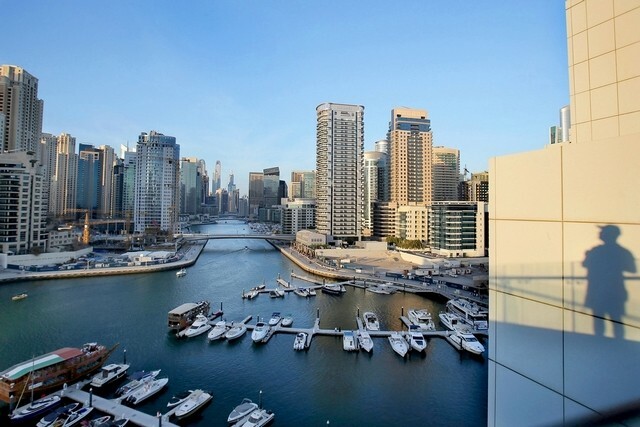 “Traffic flow and amenities in JLT have steadily improved over recent years. JLT is home to several parks, many restaurants and interesting small businesses as well as two metro stations,” said the report. “And you still get 8 percent more space for your dirham in JLT compared to Dubai Marina,” it added. The study also noted that Downtown Dubai has a high concentration of expensive serviced apartments, but with the area still subject to much construction work, it’s low rise neighbour Old Town that is proving more appealing to tenants, with rents slipping just 0.8 percent. This resilience also makes Old Town Dubai’s costliest area for rentals at AED123 per square foot. For apartment sales, Downtown Dubai remained the most expensive area in which to buy despite a 6.7 percent drop in prices to AED2,182 per square foot. That was the largest decline across Dubai as 17 of the 23 districts reported falling sales prices. In per square foot terms, Old Town was second costliest at AED2,092 followed by Palm Jumeirah’s AED1,878 and DIFC’s AED1,855. The report said the latest numbers confirm that the correction in Dubai’s real estate sector will soon approach its fourth year. He added that he also believes the market may soon bottom out. Nonetheless, 11 of Dubai’s 16 villa neighbourhoods recorded declines in sales prices during the reporting period. Villa rentals underperformed versus sales prices, which suggests landlords are less willing to leave their properties lying idle.